Whitby Town are to take on the might of cup giant-killers Bradford City in a glamorous friendly match, on Tuesday night (July 28). The League One side caused a sensation in 2013 when they dumped Premier League Arsenal and Aston Villa out of the league cup to reach the final at Wembley. They also ditched Premier League champions Chelsea out of last season’s FA Cup so it comes as no surprise that the League One side are fancied to be among the front-runners for promotion again next season. Whitby Town manager Darren Williams is delighted to attract the Bantams to the Turnbull and said they are to bring their first team squad. “Bradford are a massive club – they are a sleeping giant,” he said. “Go back a few years and they were playing in the Premier League against all the big guns. The Bantams could feature top-scorer from last season Billy Clarke and his strike partner James Hanson, although captain and former Liverpool defender Stephen Darby may be unavailable. 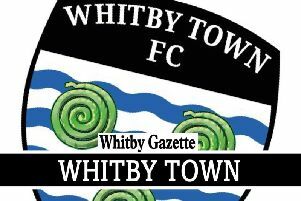 The friendly follows hot on the heels of Whitby drawing with League Two Hartlepool last Friday. They will contest the Micky Skinner Trophy at Guisborough tonight and take on EvoStik League champions FC United of Manchester at the Turnbull this Saturday - but there is no doubting Bradford is a real glamour tie. Supporters can expect to see players who will feature for the West Yorkshire outfit in their coming league campaign. “Phil Parkinson has done a fantastic job there,” said Williams. “It’s an opportunity to pit our wits against a very strong side, who will be there or thereabouts,” he said.